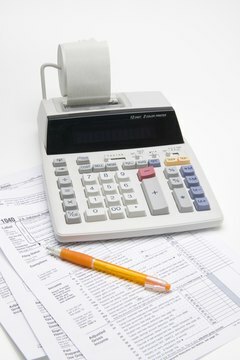 You prepared your 1099 checklist, issued the forms to recipients and sent copies to the Internal Revenue Service (IRS). Unfortunately, you receive a call from one of the recipients contesting the amount on his 1099, or you discover an error while posting an accounting transaction. You may be happy to learn that you can easily correct Form 1099. The method you should use depends on the nature of the error. The IRS considers incorrect amounts, payee names or addresses, incorrect codes and errors in checkboxes as type 1 errors. Complete a Form 1099 reflecting the accurate information and mark the box labeled "Corrected" on the form. If the recipient should not have received a 1099, such as an employee for whom you included the payment on his W-2, prepare a new Form 1099 reflecting payments of "0" and mark it as "Corrected." You will need to prepare a new transmittal cover sheet, Form 1096, to send the corrected form to the IRS. How Do I File an Amended California Tax Form 540A? The IRS classifies errors involving your information and returns filed on the wrong 1099 as type 2 errors. If you omitted your taxpayer number, such as your Social Security number or employer identification number, or your taxpayer number, name or address was incorrect, prepare a new return and mark the "Corrected" box. Enter the recipient's information exactly as it appeared on the original document, but enter a zero for all dollar amounts. If you used the wrong form, you must prepare two forms. Complete one form of the same type as the original, enter a zero for all dollar amounts and mark it "Corrected." File the proper form, complete with a new 1096 transmittal form. On your 1096, write the reason for the correction, such as "To correct TIN," in the bottom margin. Even if you filed your original 1099 forms electronically, you may be able to file corrections on paper forms. Employers who do not have a waiver from the IRS must file electronically if submitting more than 250 forms. The IRS counts originals and corrections separately. To illustrate, if you filed 500 original 1099 forms electronically and need to correct 50 of those forms, you can file paper forms. However, if you need to correct 300 of the original forms, you must file the corrections electronically. You will need to enter the same information for an electronic correction as on a paper form. If you have not sent the form to the IRS or the recipient, you do not need to file a corrected form. Instead, mark the box labeled "Void" on the 1099. The IRS will ignore that form. If the original 1099 contained an account number, be sure to include it on the corrected form so that the IRS can match the two 1099 forms. Do not separate 1099 forms if the page contains more than one form. If the correction involves an error applicable to state or local taxes only, do not send the IRS a corrected form. Instead, contact the appropriate agency to determine how to correct information that has been submitted to it. You must furnish recipients with corrected forms. Do not include copies of your original 1099 or 1096 forms when sending corrections to the IRS. Joyner, Jeffrey. "Can 1099s Be Corrected?" , https://legalbeagle.com/12026411-can-1099s-corrected.html. Accessed 21 April 2019.